Image Credit: Wikimedia Commons / US Department of Defense / MSGT Jose Lopez Jr.
Is the case in Asia for conventional U.S. cruise missiles strong enough to justify the INF withdrawal? 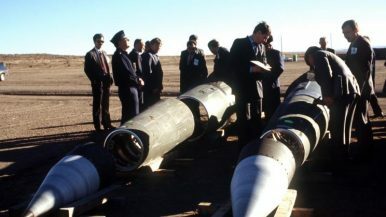 The Diplomat‘s Ankit Panda (@nktpnd) speaks to Robert Farley, a visiting professor at the U.S. Army War College, about the U.S. decision to withdraw from the Intermediate-Range Nuclear Forces (INF) Treaty. The conversation covers the case for and against INF withdrawal in the Asian context. The views expressed here are by Robert Farley are his personal views and do not necessarily reflect those of the Department of Defense, the U.S. Army, the Army War College, or any other department or agency of the U.S. government. Correction: The host refers to South Korea’s Hyunmoo missiles as “cruise” missiles; they are, in fact, ballistic missile systems. Click the arrow to the right to listen. If you’re an iOS or Mac user, you can also subscribe to The Diplomat’s Asia Geopolitics podcast on iTunes here. If you use Android, you can subscribe on TuneIn or on Google Play Music. If you like the podcast and have suggestions for content, please leave a review and rating on iTunes and TuneIn. The MGM-140 Army Tactical Missile System (ATACMS) is likely to be tested in Japan this year. Authorities are wary of misinformation spreading in the aftermath of the attacks.